The significant impact of small children, even if confined to the corridors of one of the country’s leading children’s hospitals, may help Wabash men take their philanthropic efforts even beyond John Meyer’s dreams. Meyer helped organize the first Relay for Riley as a member Alpha Phi Omega, a national service fraternity. Meyer’s enthusiasm, after the first year’s $2,800 effort, boosted the 2004 fund-raiser to more than $10,500. But a visit Wednesday to Riley Children’s Hospital, Indianapolis, to tour and present the ceremonial check helped seven other Wabash APO members understand the real impact Riley has on children's lives. "It just brings it closer to how important this really is and why this should be continued," said Jeremy Wilcox ’07. "I asked John what got him involved and so motivated to do this and he said he was coming down here and realized how important this really is." Meyer’s mother, Becky, volunteers at Riley. And though John was born at a different Indianapolis hospital, he had problems as a baby that motivated his mother to get involved. This was a case of like mother, like son. Meyer was noticeably quiet near the end of the Jan.25 visit and has expressed concerns for the fund-raising event after he graduates. "I’ve been taught leadership from my parents my whole life, through Hoosier Boys State, through high school, through sports," Meyer ’05 said. "The biggest homage they could do to this event would be to not only meet the goal we set this year but exceed it next year as well." Wilcox and James Satkus ’06 will co-chair the 2005 Relay for Riley. Satkus won’t lack for personal motivation – his mother survived non-Hodgkin’s Lymphoma and had a stem cell transplant. Though Satkus saw enough of hospitals when his mother was ill, he’d never been to Riley before. "This means a lot to me, especially with my mom being a cancer survivor, to see what these kids have and the chances they have. "It solidifies my desire to help them all the more. I’m really excited to be taking over the reigns with Jeremy next year." The Wabash guys are already talking about a $15,000 goal. The Riley Foundation leaders learned not to underestimate Wabash men. "John came at Christmas time last year and brought a check for a little under $3,000," said Heather Meek, a foundation officer who works with religious, service, and civic organizations raising money for Riley. "John said to me then that next year it’s (check) going to be for $10,000 and I didn’t even doubt it." Additionally, Meeks thinks the APO effort is a template for other campuses large and small. "I really think it would serve as a model for other organizations for what you can do if you’re really willing to get out there and work hard. "John first came to me a couple of years ago and put this event together and raised nearly $3,000 which we think is an incredible total for a first-time event with college kids. Then to come back a year later with a check for over $10,000 is just unbelievable. It just shows the commitment of these kids. Now they’ve have visited the hospital and been able to see what their hard work is going toward." The signature event was a 45-mile relay from Crawfordsville to Indianapolis run in early September last year. The APO members, most not athletes, ran the distance as a relay team. Eight APO members toured the hospital after spending one-on-one time with children in two different hospital play areas. 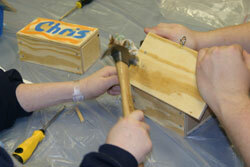 Photos: Top right, John Meyer '05 helps a Riley patient with his bird house. 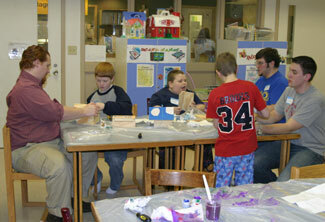 Bottom right, Jeremy Wilcox, Don Feeney, Meyer at work with Riley kids. Hewitt is Wabash College Director of New Media and Web Content Editor.